Gosh what a cold but beautiful morning we all woke up to Sunday, very very cold indeed but gorgeous!! The brave weekend ladies were out there competing in their Individual Stableford Competition. Hopefully, the early morning mist didn't delay your start too much!! Looking back on the week, we saw Tuesday's competition of 'Double off the Odds' being strongly competed for by playing partners the 'KC's!! Katy Cook that is, coming 2nd on count back from the second KC.... Kathy Carroll both on 28 points, with Lesley Bonsor, also on 28 points, who this time lost out on the prizes! Well done ladies. 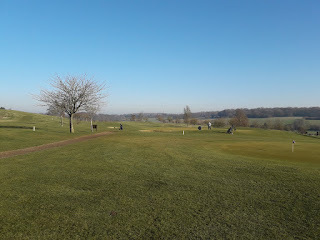 Thursday was the latest round of the Winter Eclectic and on a day when my playing partner and I were tearing our hair out in frustration at not being able to achieve very much at all, I am sincerely hoping that others were more successful, I know the third of our trio seemed pretty pleased with her round!! Over 30 ladies attended the Rules Meeting last Wednesday. For those of you who couldn't make it, the rules were delved into deeper and there we reached the issue of the rule which affects Chesfield's Ditch. Specific options were provided that we might adopt and to date we have no definitive answer to our concerns. It is a big decision and the club do not want to make any knee-jerk decisions. Having had time to reflect, I am personally in favour of abiding by the new rules of golf with regard to our ditch. Any advantage gained by playing out of the stones is minimal in reality, especially when you consider how few people prefer to do that, rather than take a penalty drop where you have more control over where the ball lands. I will, of course, keep you informed of the final decision. An important request from Lin Goodey, our Competition Secretary. If you have, for any reason, a need to pull out of a HowDidIDo match, can you please let Lin know first before doing anything else. She will then adjust the bookings accordingly and remove your name herself. Equally, if you are looking for a game but there appears to be no spaces, once again contact Lin who will hold a reserve list and slot you in, if she is able. This should help to run things smoothly. Finally, as generally happens this time of year, several of our ladies are flying off to warm climate for a wonderful holiday of winter sun. Enjoy every minute of your time away and we look forward to seeing you all when you get back. WOW!! the cold certainly didn't affect Clare Breen's game who scored an amazing 43 pts, winning the day and as a result she sees a 5 point cut to her handicap!! Brilliant Clare keep it up.